I've gotten a bit of a home owner's vocabulary now that I'll share in a bit. It's good to know this stuff but I kinda don't want to know sub-flooring, joists, dry wall, copper pipes, forced air, radiant heating, blah, blah, blah. The cons seem to be that sometimes you have to wait for the hot water to get going which is lame if all you want to do is wash your hands or hand wash dishes. The brand that people like I guess is Takagi. It's interesting to read up on it anyway, apparently the system can be used for radiant floor heating too. Probably not going to get a tankless water heater but it's cool when I hear other people get it installed, it's becoming quite popular and already used widely in the UK. There are other energy efficient things we're looking at like insulation (easy to do, just need to get done) and solar panels (but not for another 5+ years). We've got energy efficient windows, a front loading washing machine, and that's about it on the being energy efficient stuff. If you think I'm wrong on some of these tell me and help me fill in the blanks if you can. Bang, bang, bang! It happened about 6am, a couple months ago, in the morning directly across the street the day before we were to go on our Hawaiian vacation. A drive by, three shots and a peel out, no one died, a teenage girl grazed by a bullet, no newspaper stories, and the people who got shot at weren't even going to report it. 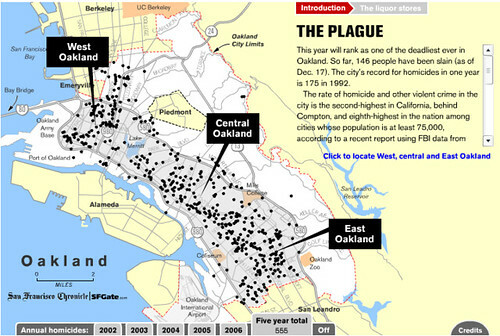 The next door neighbor reported it, they just moved in and paid over $500k for a 3 bedroom house in Oakland, 128 homicides and counting. This was across the street. Bang, bang, bang! It's late this election night. What is that? Whoa, it's a cane knocking against a fence as I peer out the window. It's Ms. Mary, our 65 year old neighbor, that woman knows everything going on in this neighborhood. I put on my slippers and run to the fence, open the gate, and I find Ms. Mary sitting on the ground not able to get up. She slipped as she was putting her garbage away, it's garbage night tonight. I help Ms. Mary up and tell her good night. That was next door. Bang, bang, bang! Is that the sound or is it rat-tat-tat of continuous gunfire in Iraq? I've established I'm not a very good citizen. I don't know what's happening in Iraq at all until one day I decided to look it up on Wikipedia. 2,900 people died on 9/11. 2,800 US soldiers have died in Iraq. We've been fighting since March of 2003? 43,000 Iraqi citizens are estimated to have died? Really? How far away is Iraq? It's not next door and it's not across the street. Bang, bang, bang! I wish that sound is me knocking on the door of all those people who won in today's election — Barbara Lee, Nancy Pelosi, Diane Feinstein, Arnold Schwarzenegger and everyone else. Congratulations on winning your election, now can you do something about all this banging. The Web is unlike television, watching movies, reading a book, or writing content — with each there's a definite start, stop, and length. The Web isn't as clear and it has multiple concepts of time, various content with different time requirements (text, images, videos) and time concepts abound and are unpredictable. Here's an attempt to categorize the different time concepts and possible solutions for attempting to make more sense around time. There's potential to surface these different concepts within a browser to make users aware of the concepts of time for various applications and services. We'll look at: Real Time, Day Parting, Temp, Archives, Time Zones. The use of meta-refresh was a method to establish "real-time" but it's also a method to boost page views. Users don't like their pages being refreshed automatically unless it's for a very good reason e.g. live scoreboards. Real-time apps used to be premium applications but some still are. Depending on the app, probably could get away with charging for the service. One of the metrics around real-time apps is simultaneous usage measured by concurrent users. Users expect applications to be real time and for transactions to post real time. If an application is not real time, the application provider will or should note the length of time e.g. updates every 15 minutes. Day parting is based on Eastern (Daylight) Standard Time and not based on individual time zones, in other words not custom tailored to your time zone. Day parting is usually driven by an editorial/programming team. Sites like digg.com and Google News may get day parted automatically given the content that's available on the Web. Unless it's published or clear e.g. a Tech Tuesday, users will not recognize day parting. The Netscape.com story with announcing Survivor winners to a late timezone. Alerts and when you expect people to respond to email. When will people update their web sites (immediately? the next morning? the next week?) How do you program people to keep coming. Newsletters. The Concept of a "Browser Session"